This week we are featuring a recording from an Anti-Repression panel that took place in Denver in October of this year. The sound quality is affected by a fan system that the venue had running, but the words are well worth hearing. For the hour, we’ll hear words from a few perspectives of resistance in the U.S. currently. 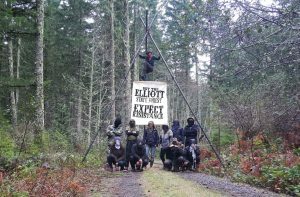 First, we hear from Danica from occupied territory of Portland about work around anti-colonial antifa resistance and self-defense in the North West. Next up, Firehawk talks about work in un-ceded Pueblo, Colorado, about working with femme, queer & trans prison rebels, Unstoppable zine and The Fire Inside project. Montana talks about autonomous relief work in Houston after Hurricane Harvey and the slow-disaster that is white supremacist capitalism in Texas. We hear from Jude talking about the J20 conspiracy cases coming out of the Inauguration, the court case moving forward and up til a few weeks ago. Finally, we hear from Jess who has been working with Water Protectors doing legal collective work up in so-called North Dakota mostly around #StandingRock with a very in-dept report-back on wider repression and specific case details. A few updates are worth mentioning in the J20 case since Jude spoke on this panel: the first defendant convicted, Dane Powell, has been released and there is a linked support site for his post-release; two of the riot charges have been dropped down from Felony to Misdemeanor; & the first court dates have been moved forward to November 15th and info about how to help with court support can be found at Its Going Down. As stated above, 2 of the initial 8 felony charges (‘engaging in riot’ and ‘conspiracy to riot’) have been dropped to misdemeanors, thus shaving decades from the potential sentences of the defendants. We here at The Final Straw suggest that Judge Leibovitz use a secure tor browser and visit https://dropj20.org to learn more about ending this expensive, insulting and dangerous act of political persecution that is the J20 case. For a 59 minute long, radio clean version for syndication purposes, please visit the archive.org collection. To follow up on something that I said toward the beginning of the interview, about logging around the Asheville area, there were plans in place to log in the Pisgah and Nantahala National Forests as of 2014. The stated reasons for this logging were environmental and maintenance minded in nature, but it’s thought that those endeavors would help literally pave the way for future commercial logging by establishing a roadway system through the forest. The J20 inauguration arrestees case is starting on November 15th. There is a call out for court support including note takers, as well as folks to fill the court in their finest black dress clothes, also for fundraising and any legal support you can muster. For a really good article on the topic, check out https://itsgoingdown.org/j20-case-need-know/ . Despite the good news that 2 of the Felony “Riot” and “Conspiracy To Riot” charges being dropped down to Misdemeanors this case still has a long way to go. 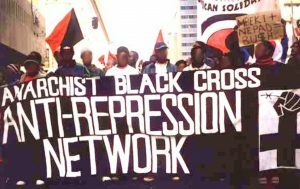 For those in the Asheville area coming up Blue Ridge Anarchist Black Cross has 3 events we’d like to share with you. Firstly, today from 5pm to 7:30pm BRABC will be hosting it’s monthly Political Prisoner Letter Writing Night. The first Sunday of every month, join BRABC, who’ll provide stationary, stamps, pens, camaraderie and the addresses of political prisoners with upcoming birthdays you can write to. Or, just take the time to hang, or write to someone you know behind bars. This month, they’ll also be showing TROUBLE #7 about anarchist disaster relief in the Western Hemisphere plus maybe another film. The pre-registration for BRABC’s benefit Ping Pong Tournament is coming up fast. If you wanna play and help earn some money for legal support coffers, send an email to blueridgeabc@riseup.net by November 12th and then show up November 15th at 6:30pm at the Standard Pizza at 755 Biltmore Ave in South Asheville to battle for a good cause. If space allows and you miss the pre-register, show up the day of and there might be a spot. Also, keep an eye on our website, thefinalstrawradio.noblogs.org, this week for a special podcast conversation between Bursts and the anarchist hip hop artist, podcaster and rad dad outta Denver, Sole. Should be dropping Tuesday. We talked about Channel Zero Network, about prisoner support, the J20 inauguration case, the Situationists and a bunch of other topics. You can hear some of Sole’s work including his podcasts at his website.